The cumulative progressive contest is a contest that runs for 1000 games. It gives a prize to the 10 best ranking players, the first prize of course the highest and the 10th the lowest. 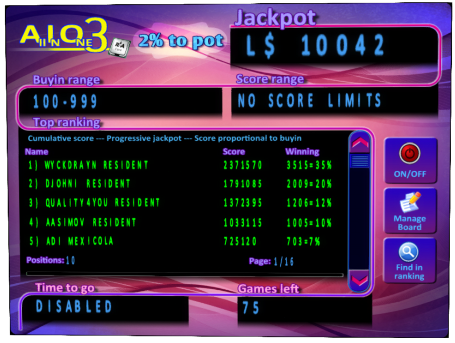 The prize is a percentage of the pot, this pot increases with 2% of the played amount, everytime someone plays a game. You can see the prize amounts, total pot so far, and percentages on the contest itself. So if you play a L$300 game, your score counts 3 times heavier as a L$100 game. (Thus if you play L$300 by playing 3 times a L$100 game, it is the same as one L$300 game). You can inspect your own rank at the contest by pressing the Find in ranking button. You should take into consideration the playing of others. There are only 3 spots on the board that give a prize, so competition is fierce. Any good strategy also takes into consideration all other contests and rewards. A = The average score per game. M = The maximum buy in, the board divides scores by M.
GP = The buy in of the game you want to play. You most likely don’t exactly know the average score you can expect per game. A good rule of thumb, take about 90% of the score as given on the X2 multiplier. That is far from exact but remember, you are only making an estimate. Please note When playing a game it can happen that you still have some rounds left after you already beated the target score. It is wise to continue playing as good as you can anyways, every point you score will count for the contest.